Our flexible Vinyl and Rubber flooring mats are custom molded to fit the floor of your truck, van, SUV or taxi cab. We have both custom molded vinyl or rubber automotive flooring available, depending on your vehicle and the application. Our truck rubber mats are made to the same specifications as OEM rubber mats, and in most cases require no cutting, making the installation easy. Our molded rubber flooring mats are the perfect replacement for your original carpet, if you are converting your truck or van to a work vehicle or if you simply want something that will clean up easier and last longer than carpet. Our Rubber and Vinyl Flooring items have 77 ratings with an average score of 4.87 out of 5 stars. Our molded truck vinyl flooring is heavy duty, long lasting and cleans up easy. The molded vinyl mats are vacuum molded instead of pressure molded producing a much better finished product. The vinyl mats come in a variety of colors such as black, grey, blue and camouflage. They feature a non-skid textured surface and are easy to work with during installation. 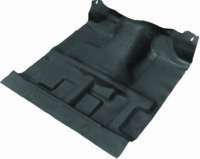 These molded vinyl mats are perfect for your truck, van or taxi cab. There are times when carpeting is not the appropriate floor covering for a vehicle. From a pickup truck or SUV that spends their time off-road or at the construction site to a taxi cab shuttling people through the city, our rubber or vinyl flooring is the heavy duty alternative. If we do not offer a custom molded vinyl or rubber mat for your truck or van, we also offer vinyl or rubber material by the yard that fits most make and moldels of automobile.